Most of us know someone who has been affected by a critical illness and understands the financial toll that it can take on a household. However, few of us have considered how we would keep our own ships afloat if we were to face a serious illness. Fortunately, critical illness insurance is available to help you financially through difficult times. Different people may choose to purchase critical illness insurance for a variety of reasons. If you’re single or you are the primary breadwinner in a single-income household, you may choose to purchase this type of coverage to ensure that you don’t lose your home or are unable to keep up with bills and household expenses in the event of a major illness. Even if you have a two-income household, you may discover that there are unexpected costs associated with recovering from a major illness, such as necessary alterations to your home or vehicle. Critical illness coverage provides peace of mind that the stress of your major illness won’t be coupled with the stress of financial hardship. Simplified Issue Individual Protection: is usually available in amounts up to $50,000, is generally affordable and easy to get. The insurer will likely ask only a few questions regarding your health and lifestyle. Fully Underwritten Individual Plan: the insurer will generally delve a little deeper into your medical history and current health status. These plans may cost more, but they offer significantly higher benefits, up to $500,000. These two types of plans are available from individual insurance professionals. You may also be able to get critical illness insurance through your employer. This coverage is not subsidized by your employer, meaning that you’ll pay the full amount, and it is usually offered on a voluntary basis. You may also have the option of adding critical illness coverage as a rider to your existing health insurance policy. How Much Will Critical Illness Insurance Cost? 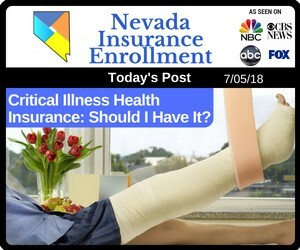 As with all insurance, the cost of critical illness insurance is largely based on your unique personal factors and how much of a financial risk you are to the insurer. Your health insurance agent can guide you in the process of choosing a plan that is right for you.